I love it when a new colour gets touted as a ‘trend’ and Pantone never disappoints. And this year, it’s another contentious choice to get everyone’s feathers in a ruffle! This is what trend predictions are all about in my view – to stop us getting too cosy, and to keep pushing the parameters of ‘good taste.’ So let’s get my cards on the table straight away. 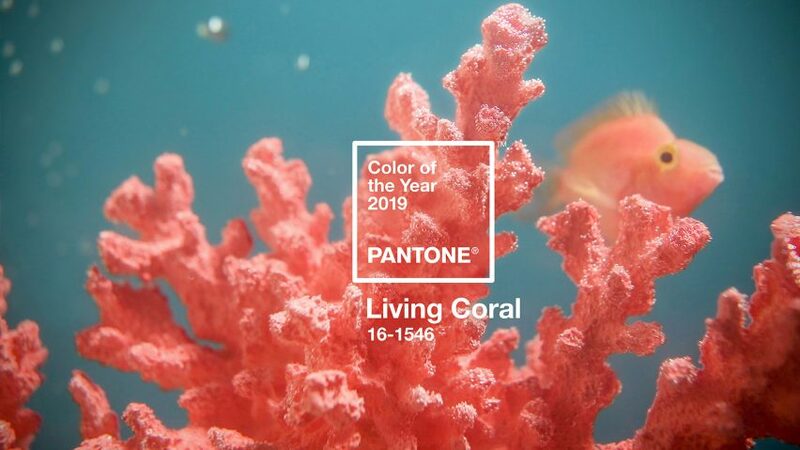 Pantone has declared their colour of the year 2019 a rather fabulous Living Coral, and I’m very much on board! In fact, I might be sailing the ship! It’s another colour that Pantone feel we need to give us all a big dose of the feel-good factor. Another strong, forward-facing strident hue that holds no prisoners. The colour for 2018 was an equally ‘shocking’ Ultra Violet – you can catch up on my report here. Pantone once again, acknowledges that we feel swamped by the digital, fearful about our politics and freaked out by the state of the planet. Quite frankly it’s all got a bit serious and heavy. So rather than give us a nice calm shade of green to go and have a lie down under, they feel it’s time to lighten up and have some fun! And that sentiment is embodied in this shade of sherbet, eighties lipstick and tropical sunsets. I have to say that I wholeheartedly concur (of course I do!). I personally find it a jolly, uplifting and rather edgy colour. Sitting in between red and orange, it loses the aggressive edge of one whilst being way sexier than the other. Like all of these trends, you need to ignore it if it isn’t for you – don’t get your knickers in a twist if it’s making you run to the hills (under an apricot sunset). If you prefer things a little more pale and uninteresting, then you could play around with it’s paler cousin peach, which has been touted as the new pink for some time. I think these orangey shades are the perfect progression from the all-things-pink obsession. Peach and coral shades have more warmth and my overriding trend forecast for the next few years, is that we will be turning our back on the cool greys and sophisticated navy in favour of colours which have warmth at their core. While the trend-setters will make a splash with it on all four walls, I think for most that it creates too much energy in a room to actually be able to live with. Instead, it will be popping up as a great accent in our interior schemes. If you have already signed up to a cool grey interior then a pop of Living Coral could be just what you need to stop taking it all too seriously. Similarly, it would look delicious with navy – or my personal favourite teamed with cobalt blue. 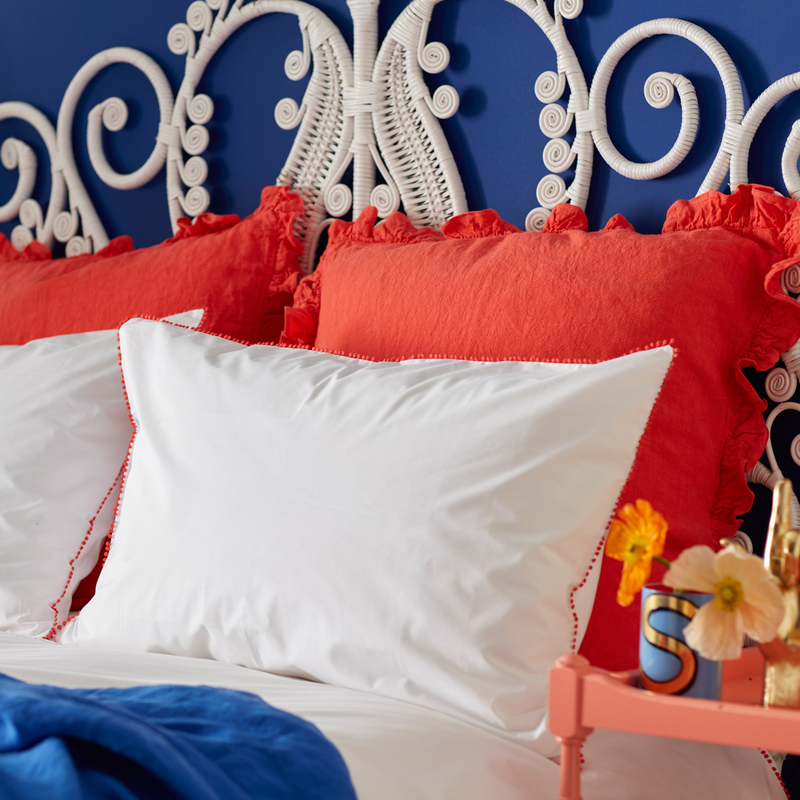 My collection of bedlinen for The Secret Linen Store uses a hot coral as an accent for cushions and a trim on the pom pom bedlinen which updates the classic white. I’d like to say I had a crystal ball, or that I’m just so smoking hot and on trend – but either way, I chose coral as one of my key colours when designing my new range of bedlinen for The Secret Linen Store earlier this year. My reasons were because it felt more modern than pink, I loved it next to the deep blue I was already smitten with and felt that in small splashes it was a great way to add pep to an existing scheme. You can buy it as a pom pom cushion and throw or as a delicate micro trim on all white bed linen. So my advice with this trend is to dip your toe in. And next time you think it has to be pink, think of adding peach or coral red instead. 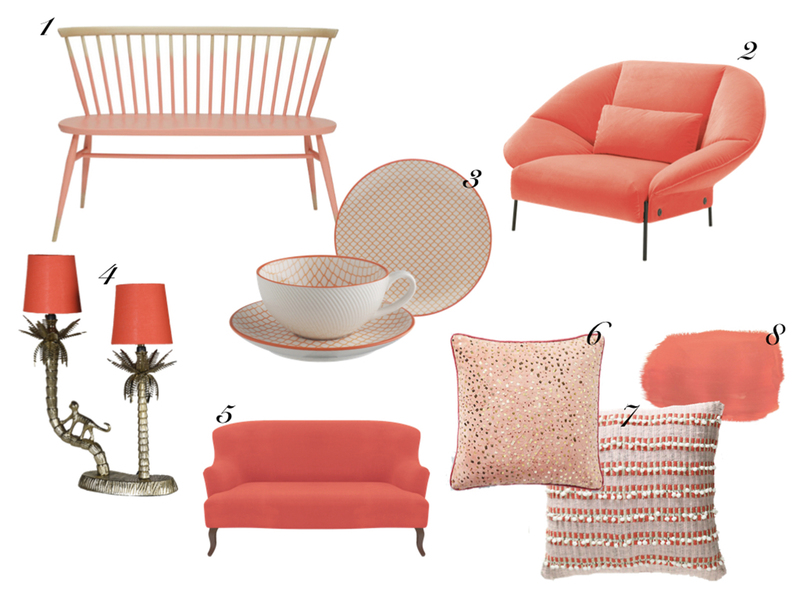 The post Pantones colour of the year: Living Coral appeared first on Sophie Robinson.